400 लोग ? इतने सारे ? भीड़ कितनी है .. no , it was not any wedding invitees you are expecting on reading this. 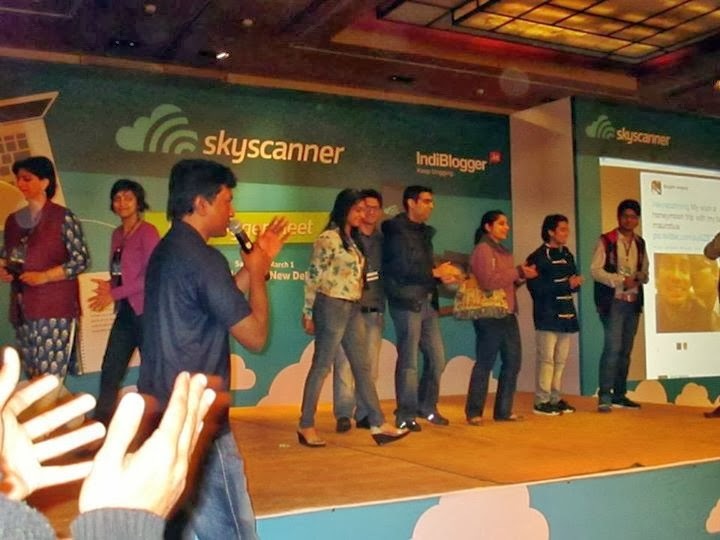 But it was more or less of a baraat as I was referring to this indiblogger meet. 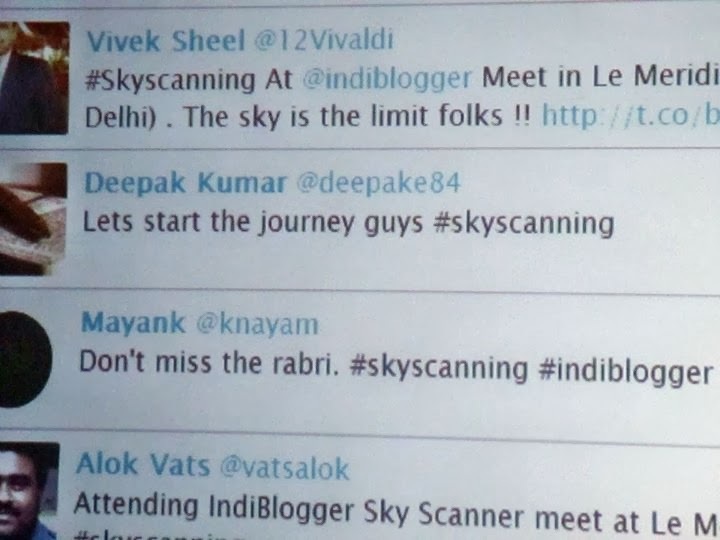 In my 7 meets with indi I have never seen so many people and the previous 2 night meets with 300 people seemed to be a bit cramped and the same location of oberoi became a bit tedious. I saw a lot of my friends backing out looking at 400 people and I too voiced my apprehensions in that regard on the forum although I was eagerly awating it as it was a Saturday day meet which suits me so well...a bunk from the office and I can be as crazy as I want to be. On the day itself, it was the short walk from the central secretariat metro station to the Le meridian. Was waiting for my friend Anupriya to come and join me at indi. My school mate and it was the first indi meet for her..I?? I am a veteran now and just like all times jatin calls me up an asks , “ कहाँ है तू , कितनी देर में पहुँच रहा है ”. He knows I`ll be there in delhi meets. Like the previous times, this time too I was before time. Just when I was contemplating whom to call and ask, I saw aditya jha and his gang of friends turn up just outside the hotel. After the formal intros we went inside. A security checkin and we proceeded forward. It was kind of deserted at that moment. Saw Anoop , Vineet, Renie and it was the usual hi hellos. It was still time and things were being setup. Untill then, it was time to meet the old buddies- gautam, meraj and a few others too. After some time the registrations started and we ventured inside. The hall was huge and I liked the ambience. Grabbing the front table we settled down with a few first timers too. 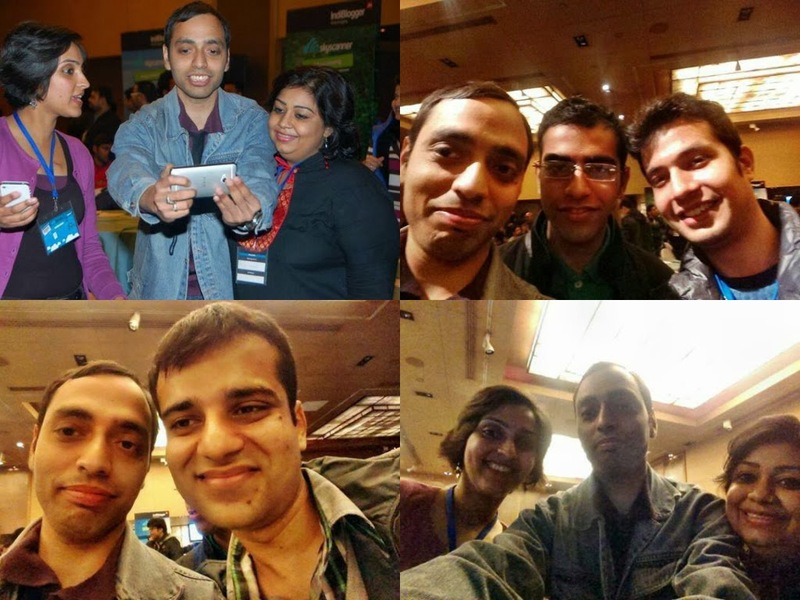 Then the lot of my best buddies came in – Jatin, Murtaza, Talreja. It was the usual laughter as we started towards lunch, in any baraat food is the first thing on the agenda...here too it was the same. 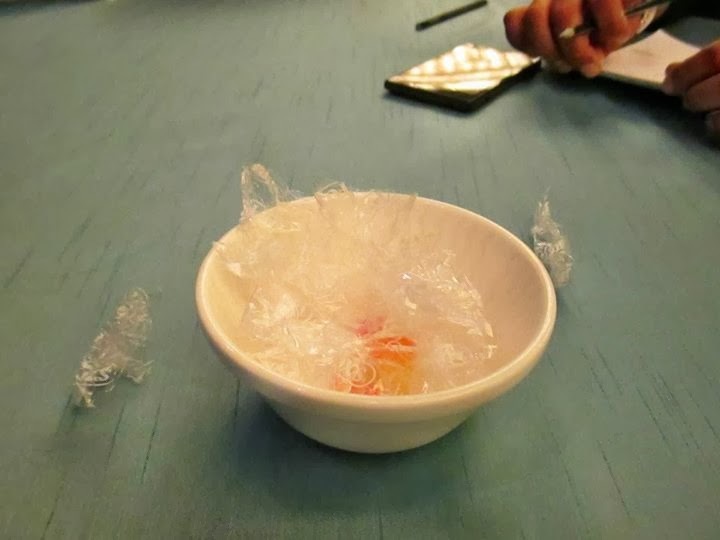 After an awesome meal headed back and I started finishing off the toffees in the bowl on the table. In a few minutes only the wrappers were left in it. The meet started with the usual anchoring by Anoop and congratulating everyone for making this the biggest gathering, I was in the firing line from the start. Anoop told that I (me) had apprehensions about the chaos of 400 people and its time to show them the chaos as Indi is known just for this thing.. Haan haan ultra मशहूर कर दो .. पहले से ही बहुत नाम है :p . The Indiblogger ghost makes his appearance once again...while anoop was busy with the mike, firstly the ghost was operating the laptop and next he was playing pranks with a paper plane to the amusement of a few kids present there. The ghost seems quite tech savy. After that it was time for the sponsor presentation. 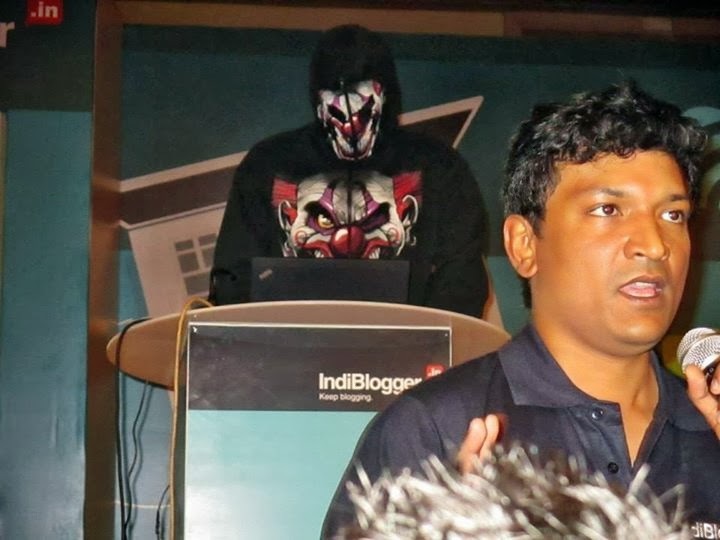 It was undoubtedly the shortest presentation I have ever seen on indi meets. 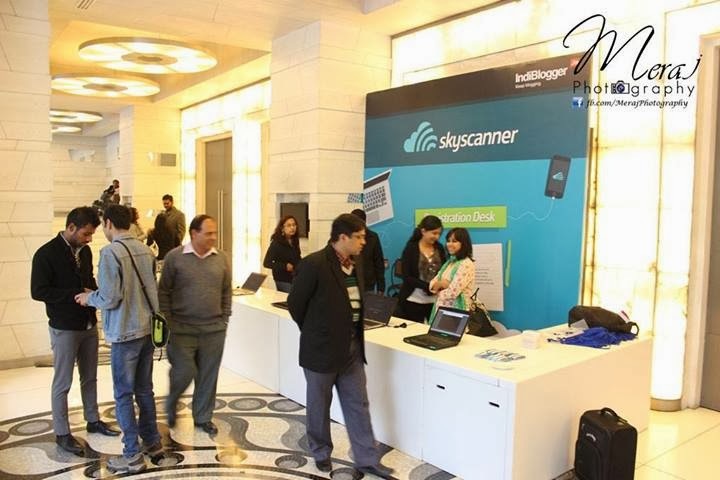 Ms. Kavitha from Skyscanner outlined the features of the site and the advantages it offered in comparison to the other sites. The classic format is back so how can the way of giving away the goodies be behind? 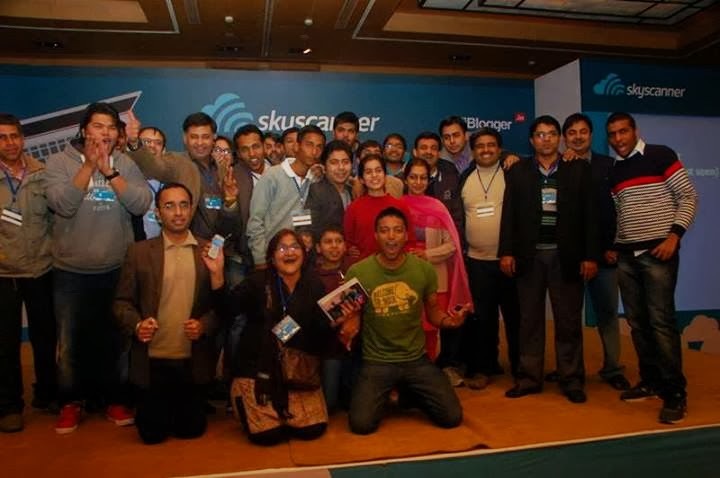 Out of this huge baraat, people were made to stand whomsoever was wearing red colour, with a jacket, having an analogue watch and finally the ones left were gifted skyscanner goodies.grrrr... I missed out. As per the huge protests, Anoop himself admitted that Indi can be unfair sometimes. The last time I won something was way back in the HP music meet. My bad luck just continues. Just wished that I hadnt worn a watch that day. Next was the most fun activity. 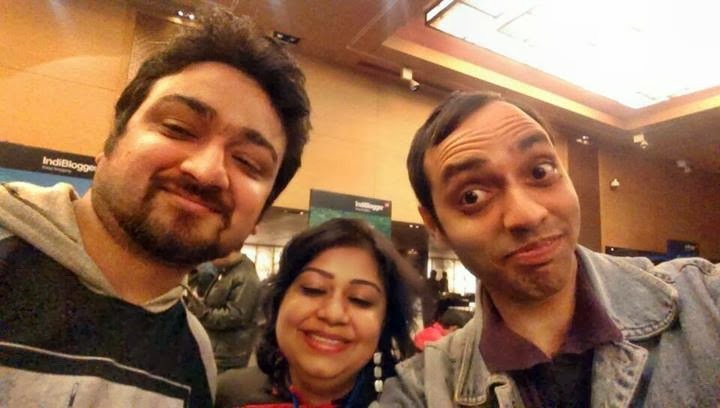 We were asked to click selfies and upload them on twitter. Selfies with friends, as many as we liked and as many people. It was all about the clicking of snaps and the phones coming to use. With no front camera on my cell I knew i was in trouble. Help arrived unexpectedly. A new friend I made Gautam had a phone with a front camera and so we went around clicking pics with friends in ballastic mode. Dipali was leading the way and I was holding the phone and clicking the pic, looked just like the videographer at the wedding. What started with 2-3 people in one click soon turned into one massive one at one point of time with atleast 6 people in a single frame and my hands were outstretched to the limit. Ouch.. 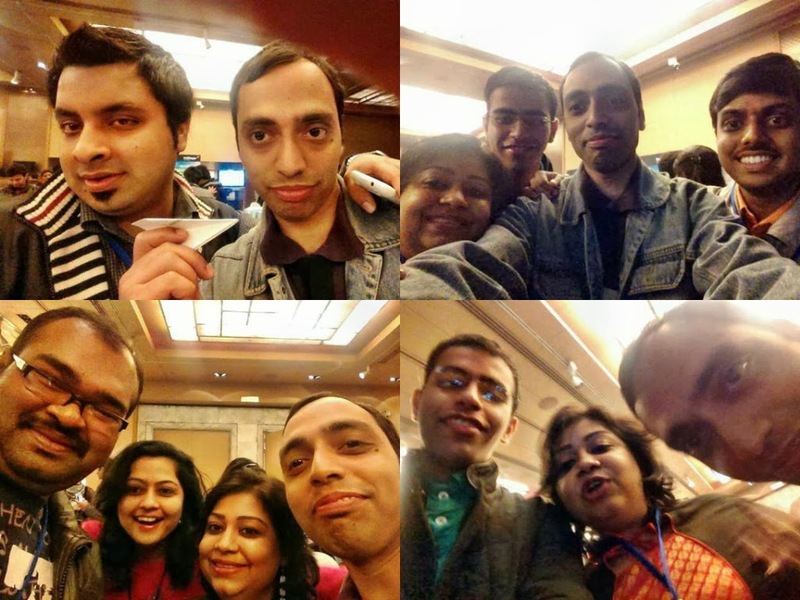 So there were various pics with my friends- Indu , Yogita, Gautam, Jatin, Murtaza, Harshit, Abhishek, Sakshi nanda all gracing the frame at some point of the time or the other. Gautam`s phone had 14 pics of us but only a few could be uploaded on twitter. We again lost out as someone who had clicked 18 selfies got a gift. It was a domestic ticket . 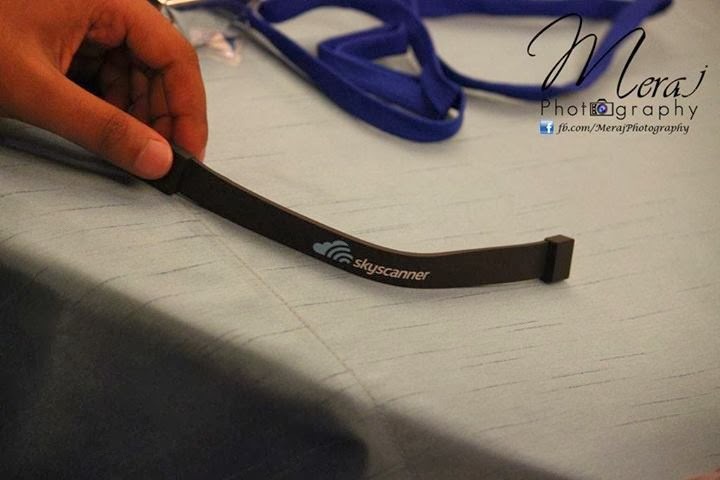 Next people were asked to tweet the destination they`ll like to visit and with whom...prizes for grabs here too. The main actitivity followed. 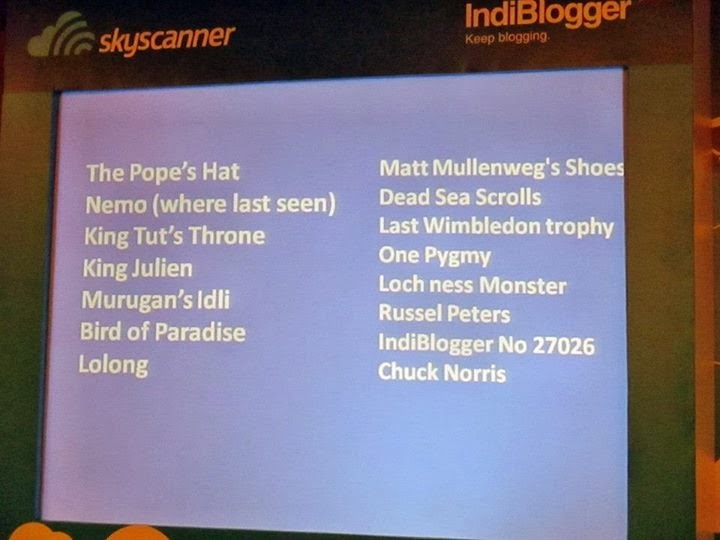 Just like a treasure hunt, 14 places famous for a few things were listed and we had to plan a travel starting from the Vatican and using the Skyscanner app to calculate the perfect way to visit all tht places and be back. We were team no. 4. 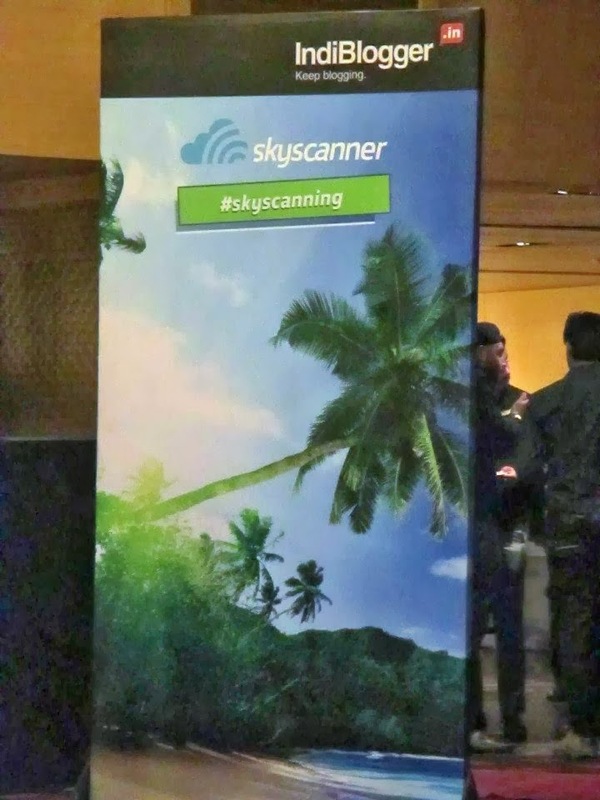 Armed with skyscanner app in 3 phones we decided the route to our journey and came to a total cost amounting 1.54 lakhs for 14 places around the world which included places as far as australia, middle east, europe and India. A team had posted 2 lakhs and we thought we had beaten them. 1.54 you`ll ask how? We did a Zindagi na milegi dobara stunt and included road trips to 3 places. Cost- 0 . So here`s how we got to such a low cost. 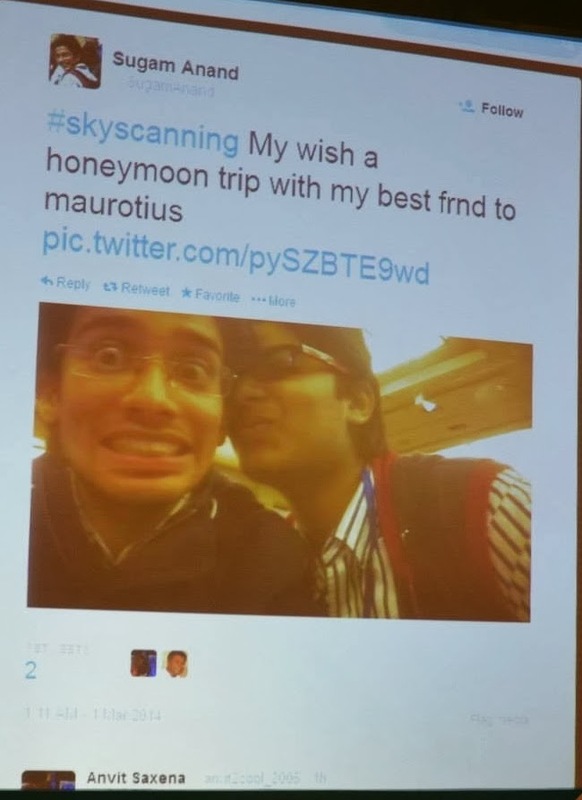 While we were planning this trip, the tweet results were announced and I dont know what happened but Aditya bhasin screamed and ran outside to collect his prize. The fun activity seeped the energy out of everyone as we headed to tea. Delicious savouries and again had a fill. It was a tongue smacking affair. After tea the 4 selfies were shortlisted for the prize. Going by the vote of the audience the winning pic got domestic tickets to a destination of their choice. 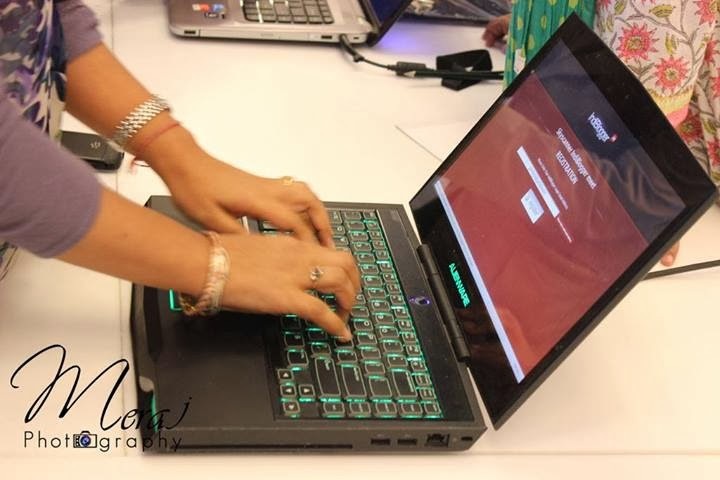 Results of the hunt were announced and due to some discrepancies in some travel or the other, the team winning had a total cost of 4.7 lakhs. Lo... here we are going economy travel and people are busy on फ़िज़ूल खर्ची . कहाँ 1.54 लाख और कहाँ 4.7 ? Self proclaimed winners (not the real ones) had already clicked the pics and now it was the turn of the real winners to have a group photo. Next came in the introductory session with people reciting their travel experiences. So we had women going to middle east, some visiting korea and some people visiting 8 countries in 2 years. The most interesting tweet in this regard was something which said that First travel South delhi fully, then think of south korea.. so true. It would have been great if it were just short descriptions but here people kept talking and talking so much that it felt like they were reading out their blogs. To the point is not everyone understands. The 8 year old girl from the previous meet wanted to go to Disneyland and I would say that the best travel tip came from Mr. Ravindra Sharma who is an Ex Indian Army. He simply said that first travel within the country and explore it and then go abroad. Its so true advice. I myself have discovered a few places in the country and I know that how much beautiful it is. With a group pic and the usual masti the meet ended. Not to forget Aditya Bhasin playing the humorist role by his tweets, you have got to read his tweets to see what he was upto that day. 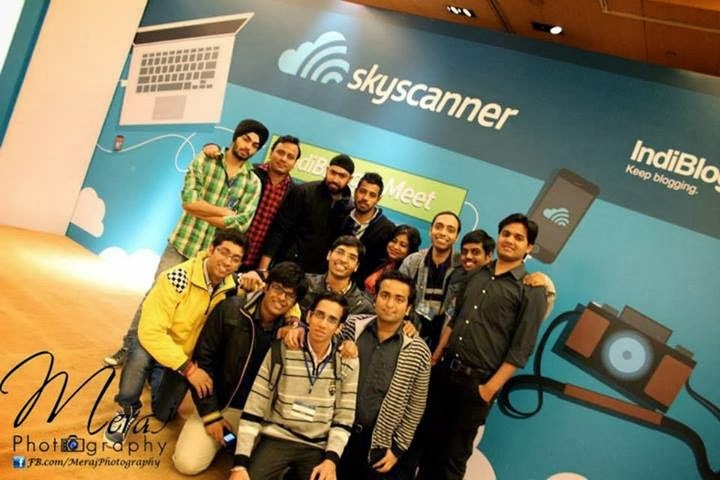 It was a day meet after such a long time , had over 400 baraatis and the honeymoon was probably made complete by skyscanner when it handed over domestic tickets to destination of the choice of the winners, the hashtag #skyscanning trended in Delhi on twitter..something which has never happned in any of the meets till now. And वैसे भी हम दिल्ली वाले हैं ...जिस भी चीज़ के बारे में tweet करेंगे वो तो trend करेगी ही . Indi needs to keep this format going. In comparison to the night meets, this one is a more relaxed format. When i look back at the activities, I see very few that day but dont know ehere did the time flew by.. probably in the company of friends it just vanished.. 5 hours just vanished. It feels a bit odd to go 5 meets without winning anything.. No baraat is complete without friends and I wouldnt have enjoyed as much had it not been for my friends that day- Dipali, Gautam, Harry, Rahul, Priyank ( at least he made it to the correct day this time), Meraj, Indu, Sakshi, Yogita, Jatin, Murtaza, Abhishek, Harshit, Aditya (both of them), the blogger Khanduja family and the others too whom I saw but just couldnt meet. 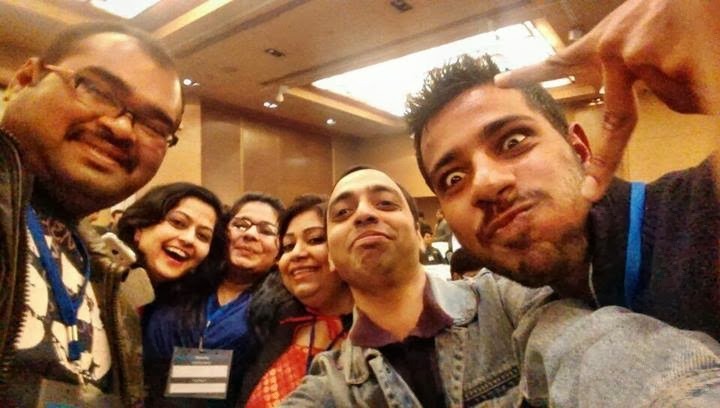 Its them and the indiblogger team which helps everyone be really crazy as they are. Waiting for the next day meet and hopefully my next prize this time. Okay, that was a fun read. As fun as the 'Zombie' one. I remember that very well. And dekho toh, you have used my pics too and made me into a celebrity! :D Thank you. Hope you get the tickets you seek! Awesome Article :) refreshed all memories ! !